Burn Camp Participants Arriving to Washington, D.C.
Our family would like to thank you for giving DJ just an amazing experience. He keeps coming out with different stories about what they did and it sounded wonderful. I know that mere words aren't enough but just knowing that he will forever remember going to DC and having such a great time is more than enough for us. Blessings to EVERYONE that worked so tirelessly to make this camp such a great success! See what burn camp participants are doing this week! Thursday at the International Burn Camp started with a tour of the United States Naval Academy and the Naval Academy Fire Department Local F-121's fire station. Campers learned about the histroy of the Naval Academy and its role in defending our country. The tour was especially memorable for Ryley Swett, 15, of Kansas City, Missouri, who has aspirations of someday joining the Marine Corps. He said, "Learning more about our country ...makes me appreciate it more. It was a really a cool experience I will keep for the rest of my life." The campers then returned to Camp Wabanna in Anne Arundel County, Maryland, for the International Burn Camp Carnival. Campers raced each other through a giant inflatable obsticle course, challenged each other in games of basketball, kayaked in the Chesapeake Bay, and danced to songs like the electric slide and the macarana. The day concluded with a fly-in by the Medstar Helicopter - campers and counselors showed their appreciation to everyone who made the week possible by spelling out I-A-F-F with their bodies for arial photographs. Getting a Taste of Maryland Crabs! Tuesday at the IAFF Foundation Burn Camp was a day of first times for many campers. It was the first time in our Nation's Capital for most as they toured the monuments, the Capital Building and the White House. Campers then returned to Annapolis where they were treated to a boat excursion on the Chesapeake Bay. Campers got to see the Naval Academy football team practicing on their shore side field as the boat chugged by. For camper Ashley Helton of Richmond, Virginia, it was her first time on a boat. When asked about her experience on the gently rolling sea she said, "It was fun, even though I almost fell." 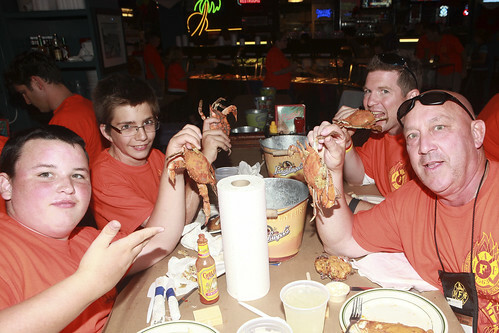 Finally, tired campers and camp counselors gathered at Buddy's Crabs and Ribs to partake in the Maryland tradition of eating Blue Crabs seasoned with Old Bay. The Crab Feast was sponsored by the Anne Arundel County Professional Fire Fighters Burn Foundation, Inc., and supported Anne Arundel County, MD Local 1563. The art of cracking the crab shells with a mallet and getting to the soft meat inside was new to most of the campers, but there were plenty of local fire fighters on hand to show them how. Anne Arundel County Professional Fire Fighters Burn Foundation member Kathleen Grote summed up the crab whacking; "It's a lot of work for a little food, but it's a social event for Marylanders." That certainly was the case as campers and counselors ended the day having shared many new experiences together. President of the Anne Arundel County Professional Fire Fighters Burn Foundation Michael "Stosh" Sosnoski, Secretary Deborah Sosnoski and Treasurer Kathleen Grote all attended. - Reported by Brian Holtslander, Anne Arundel County, MD Local 1563. 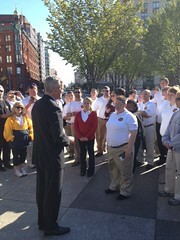 Deputy National Security Adviser Denis McDonough addresses campers and counselors from the 2012 International Burn Camp outside the White House Tuesday, September 25, 2012. Mr. McDonough thanked IAFF members for their service and the young burn survivors for their courage and spirit in the face of adversity. The Burn Camp tour of the White House coincided with President Obama’s speech at the UN General Assembly. Mr. McDonough emphasized how the fighting spirit of fire fighters and burn survivors set an inspiring example for Americans struggling to care for their families at home and abroad. The White House tour was the first stop on a day tour of the Washington, DC metro area which will include lunch at the U.S. Capitol followed by a boat tour and dinner in Annapolis, Maryland, hosted by Anne Arundel County Professional Firefighters Local 1563. Camper and counselor cameras were confiscated today as they reported for assignment at Washington DC's International Spy Museum. All safely reported back to the Reagan Building for a debriefing and well-earned meal after their efforts to protect the world from nuclear threat. This afternoon, campers will spend a couple of hours at the Smithsonian's Museums of American History and Natural Sciences. 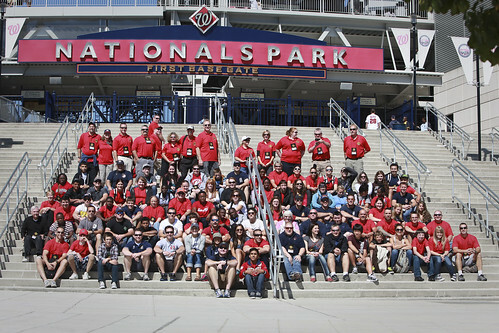 Burn camp participants attend the Washington Nationals and Milwaukee Brewers baseball game. Mr. Willie Robertson, CEO of Duck Commander and star of Duck Dynasty, poses with Ashlea a camper from Tennessee at today's Nationals vs. Brewers game. Anne Arundel County, MD Local 1563 member Brian Holtslander was one of several Local 1563 fire fighters who greeted campers Saturday from around the United States and Canada arriving at Baltimore/Washington International Airport for the IAFF Foundation Burn Camp. He reports that Anne Arundel County Local 1563 members helped carry baggage and transport them to BWI Airport Fire Station for a reception. At the Fire Station, Baltimore/Washington International Airport Local 1742 fire fighters gave campers a tour of crash rescue equipment and prepared a lunch of sandwiches and cold drinks for campers who had come from as far away as British Colombia and California. Local 1742 President Dan Gordon captured the experience of IAFF members at the reception, saying that "...we can be a friendly face and a room to relax. This is another way to assist and ease the path to recovery." After the reception, campers boarded ltour buses for the trip to Camp Wabanna in Edgewater, Maryland. After some great organization on the part of Anne Arundel County, MD Local 1563 members and the warm hospitality of Baltimore/Washington International Airport Local 1742 members at BWI Fire-Rescue Station, the campers attending the IAFF Foundation International Burn Camp heads down to Camp Wabana. 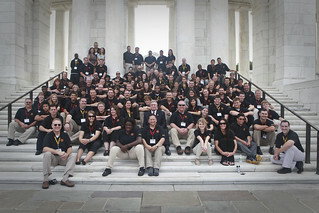 International Burn Camp participants and counselors arrive in Washington, DC tomorrow! Keep up with all their activities as we will be reporting from the Burn Camp all week long. Expect to see updates from the Opening Ceremony, Tour of the U.S. Capitol and more. Also follow the IAFF's social networks on Facebook and Twitter for updates. Teenage burn survivors from across the United States and Canada soon will travel to the Nation’s Capital to participate in the 17th Annual International Burn Camp and form new friendships that last a lifetime. The International Burn Camp, organized by the International Association of Fire Fighters Charitable Foundation-Burn Fund, provides a network of support for teens to help them cope with their injuries. Burns can leave scars that never heal. Often they leave emotional wounds that no medical care can repair. The camp allows teens to share their experiences with each other and share stories of courage, success and survival. Participants are paired with a professional fire fighter/camp counselor from burn camps across North America. amp Wabanna, they also get to tour DC monuments, memorials and museums and are given the opportunity to visit with national leaders and local fire fighters. 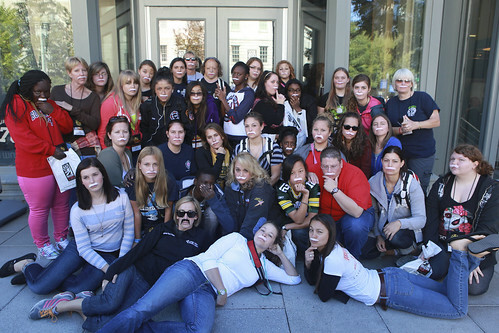 In previous years, teens have been greeted by members of Washington’s professional sports teams and have attended sporting events like a Washington Nationals baseball game. cipants said attending the burn camp was a highlight for them before having to hit the school books. The burn camp is just as special to IAFF Foundation staff, IAFF members, counselors and volunteers who enjoy organizing the burn camp each year for the young burn surviviors. or youth, the IAFF Charitable Foundation-Burn Fund also provides support for fire fighters and their families impacted by burn injuries. You can support the IAFF Burn Foundation by giving a donation today. Although we had a tire blow out on our trailer on the way up, the Camp DJ's from IAFF Local 122 / Camp Amigo have made it here from Florida. Myself (Buddy Harris) and Kevin Sadler brought a rockin' sound system and light show to keep our campers hopping when time permits. We will be setting up some cool stuff Saturday, but the big dance on Friday is where we will really shine! Bring on the campers!